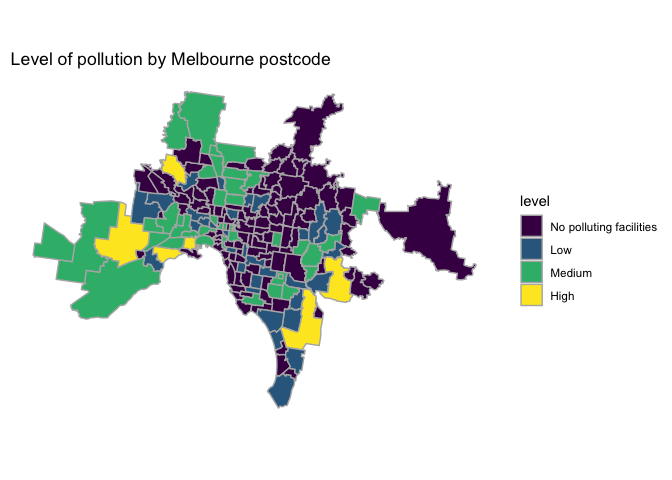 The recent ABC News article Australia’s pollution mapped by postcode reveals nation’s dirty truth is interesting. It contains a searchable table, which is useful if you want to look up your own suburb. However, I was left wanting more: specifically, the raw data and some nice maps. So here’s how I got them, using R.
The full details are in this Github repository. There you’ll find the code to generate this report. Rather than copying/pasting/formatting code here, I encourage you to look at the report. Result: maps, like the one on the right. I sometimes think R makes this kind of thing almost too easy.